Three days in San Juan was all it took to fall in love with the beautiful island of Puerto Rico. Why hadn’t we visited San Juan sooner? My husband's parents were born on the island, but this was his first trip—one we hadn’t expected to take. A last-minute and hastily planned getaway. We only got away for a few days. It was our 21st Anniversary and the second honeymoon we forever dreamed of taking. And San Juan did not disappoint. There is so much to see and do in Puerto Rico, and we intend to go back to the island to enjoy everything this Carribean dream destination has to offer. Hubby can even see us living there for a while enjoying the fabulous weather, crystal blue waters, and the old-world setting and atmosphere of Old San Juan. If you love history, old cities, forts, beaches, fantastic restaurants, or casinos, Puerto Rico is a must-visit. It has something for everyone. Where did we stay in San Juan? We stayed in a lovely Airbnb apartment in Old San Juan steps from La Princessa de Passeo. The well-equipped budget-friendly accommodation was in a 500-year-old building with stunning arches and artwork. A perfect location awaited outside the door, which opened into the blue cobblestoned streets of Old San Juan. From our apartment, the old city was at our feet, every tourist site, restaurant and shopping opportunity within walking distance. We did not regret our decision to stay in Old San Juan, which was only a quick 15-minute taxi ride from the airport. The taxi stands outside the airport were convenient, and we felt completely safe even though it was after 3 a.m.
We picked the place for the convenience. We wanted to wake in the morning and walk through the colorful streets amidst artisans and old churches within the walled city. It was a beautiful private apartment with queen bed, lovely modern shower, and kitchen (to ensure I could eat safely). The accommodation included beach towels and bicycles. We were excited about the bikes but didn’t end up using them as the location was perfect for strolling. The only frustration was no wi-fi. There was a hot-spot available to us, but the signal was slow and spotty. I believe the inconvenience is just a by-product of the island recovering from Hurricane Maria. The only thing I would have changed had I been aware of the spotty cell service is I would have done more food research and brought printed maps and reviews with me. Searching for suitable restaurants that were capable of handing my dietary needs was challenging as it took a while to load web pages. And even though Verizon claimed that Puerto Rico was in our service area (a pleasant change from the $10 per day, per device fee we paid while we were in Europe), our phone service did not work, so it is a good thing we didn’t get separated. Crappy internet signal would have been a bigger issue had we been traveling with the boys. We got a late start getting up around 9 a.m. after arriving in the early morning hours. I know we didn’t sleep much but who could sleep with such a beautiful city waiting to be explored? We started our day at the lovely Cafe Berlin on Calle San Francisco in Plaza Colon soaking up the local culture while people-watching from an air-conditioned table inside the restaurant. We enjoyed a lovely gluten-free breakfast of eggs, sausage, home fried potatoes, gluten-free pita bread with delicious guava butter and gluten-free pancakes that we couldn’t finish. We sipped lattes planning our three-day adventure. After breakfast, we browsed the Artesian vendors and shops along Old San Juan’s colorful streets before exploring the first of the two old forts inside the 500-year-old walled city. There are two forts to explore in Old San Juan, San Cristobal, and El Morro. These two World Heritage Sites require a small admission fee. The cost is $7.00 for entrance to both forts, and you can visit on two consecutive days. Remember to keep your receipt. San Cristobal was just steps from where we ate breakfast. On Day One we decided on San Cristabol because it was conveniently located steps from Plaza Colon and Cafe Berlin where we ate breakfast. We could’ve spent all day at San Cristabol feeling as if we’d been transported back in time, tramping through tunnels and peeking into old dungeons. And the views from the ramparts were spectacular. There were many perfect places for photos ops, and even the local iguanas got in on the action. By mid-afternoon, I was ready for the beach! We headed back to our apartment, grabbed the beach towels, sunblock, a couple of bottles of cold water, and took an Uber to the closest beach to Old San Juan—Escambron Beach. Relaxing for a couple of hours on the beach was just what we needed before dinner. Escambron Beach is technically within walking distance of Old San Juan, about a 1.5-mile walk from the Airbnb and we had intended to either walk or ride the bicycles there. But after a long drive to the airport, an overnight flight, little sleep, and trekking through the old fort, my legs felt like spaghetti. The $4 Uber ride was worth ten times that amount. The local beach was lovely and clean with many Puerto Rican families enjoying the beautiful summer day. We spent a perfect few hours relaxing on our towels in the sand. The breeze was fantastic and would have kept us comfortable even if we hadn’t taken a dip in the ocean. But who could resist that beautiful Atlantic? One thing to note about this small beach is I found the sand to be rocky, and the current strong. I had difficulty standing in the water and kept feeling as if I was being dragged out to sea. I’d be a little hesitant to bring the little ones although there were plenty of small children playing in the surf. At the time of this writing, Escambron Beach was still recovering from the massive hurricanes that ravished the island. The facilities were not open (bathrooms, showers, beach restaurant, etc.) when we were there, but it was still a lovely afternoon and recommended for anyone staying in Old San Juan that would just like to relax for a short time by the ocean. And a day at the beach wouldn't be the same with out my favorite relaxing item: my Kindle Whitepaper. Books and beaches just go together, don't they? This beauty is my portable book collection, and it's waterproof! Evening time in Old San Juan is magical. The lights, music, and people milling about lends atmosphere and romance to this tiny city’s streets. I spent a lot of time worrying about finding gluten-free (GF), celiac safe, meal options in Old San Juan. My worries were unfounded. The city has plenty to offer in the way of GF meals. We enjoyed one of our favorite dinners of this trip at Mesa Verde Restaurant just two short blocks from our front door. The food and atmosphere were amazing. We will be back the next time we travel to Puerto Rico. After dinner, we strolled to the local supermarket (Supermax on Calle San Francisco), picked up wine and cheese for the evening, coffee for the morning, and headed back to the Airbnb for some much-needed rest. Our second day began with two lovely cappuccinos in our room compliments of the included coffee maker and Hubby. Although we loved sitting in the little cafes in Puerto Rico sipping lattes, having our a cup when we first woke was nice. The lobby entrance to El Convento hotel. This beautiful place is a converted convent. Before we left NY, I proclaimed I was going to the beach every day. 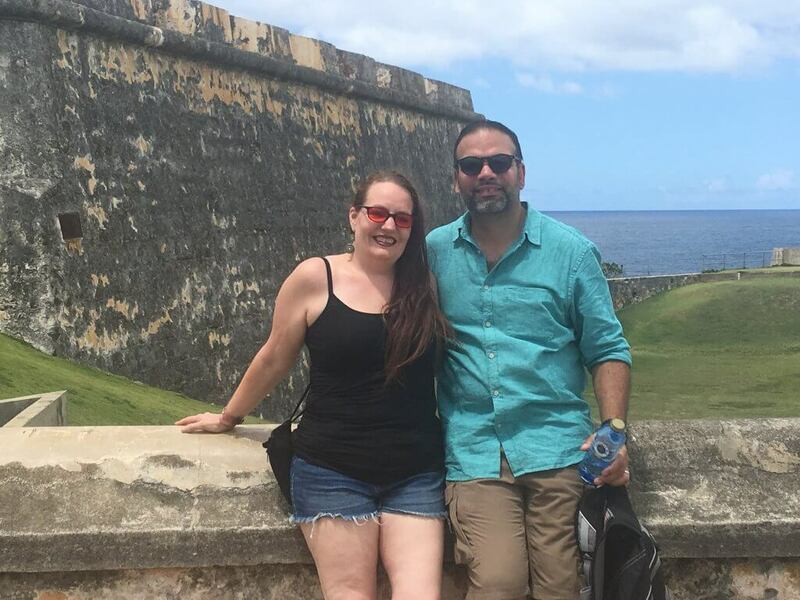 But there was so much I wanted to see and do in the old city that I forewent the beach and instead walked the colorful streets, shopped, and checked off my must-see list: El Morro, El Convento, San Juan Cathedral with Ponce de Leon’s crypt, and the waxed dead guy—San Pio. St. Francis Cappachin Church and Catacomb, a place I intend to feature in one of my monster-hunting books making this tiny but interesting little crypt top of my list. I know—weird list for an anniversary celebration—but hey, I’m a weirdo. I’m okay with that. We spent hours walking and shopping at the Artisans tents set along the port road and inside the plaza. Fed the pigeons, and enjoyed our day. San Juan Cathedral is the oldest building in the walled city. I wanted to see Ponce de Leon's tomb, but it was not open without calling ahead--next time. Old San Juan is entirely walkable, but after all the walking we did, I was exhausted. So another $4 Uber ride over to El Morro was completely worth it. We didn’t take the trolley that takes you directly up to the entrance and wished we had—just look at that long walk up to the fort. The grounds at El Morro were breathtaking. Locals and tourist spend breezy days flying kites on the fort’s expansive grassy areas. Kite flying was on my must-do list, but we arrived late in the day, and the kite vendors had already left. So I added kite flying to my list of things to do with the kids when we return. We ate lunch at a lovely and unique place: Stuffed Avocados. It sounded odd, and I was apprehensive about creamed spicy sauces over meat and avocado topped with mango and pineapple, but it was delicious, gluten-free, inexpensive, and large enough for us to share. Neither of us wanted to eat a huge lunch before our celebratory Anniversary Dinner at Marmalade. Tip: Plan for rest time. On day one we rested the beach for a few hours and underestimated how much we needed the break. Day two left me exhausted, so we rested for two hours in the air conditioning of our rented little apartment before getting ready for the evening. The perfect day was topped by a perfect evening and culinary experience at Marmalade Restaurant, whose atmosphere, food, and fabulous service deserves a review all of its own. Note: Marmalade Restaurant it was a superb dining and wine pairing experience, but it is important for me to tell you it is not a budget-friendly family restaurant. This is for celebrations or a nice night out. You won’t be disappointed. Go with the 5 Course Meal and Wine Pairing and ensure one of those courses is the White Bean Soup! Sad, sad, day number three—sad because it was our last day in Puerto Rico. Our flight out of San Juan left at 2:30 a.m., which left over twelve hours between our check-out at the Airbnb and when we had to be at the airport. We considered reserving a hotel room for that night to have a place to keep our things—even though we only traveled with a personal item on the plane. No carry-on, no luggage. I’ll tell you how to travel with only a personal item, and why you might not want to. We took an Uber to the airport to pick up a rental car. This was a great decision as the car cost us under $35 for the day, and we didn’t miss having a hotel room. We had the freedom to explore San Juan and keep our things in the trunk. Our first stop was a lovely lunch at the Sierra Restaurant on the beach. The restaurant was inside the Marriott Resort and Casino in Carolinas. I would recommend a visit. There is a small casino to play about it, a beautiful beach where we lounged the afternoon away and swam in the clearest, water with soft powder sand. We arrived in our swimsuits beneath cover-ups. Parking is in an indoor garage for guests—both staying at the hotel or just visiting the restaurants, casino, and bars. Our view of Isla Verde beach from the table at Sierra Restaurant. All beaches in Puerto Rico are public, so we stepped onto the lovely white sand directly from the table where we ate our lunch. Although we enjoyed Escambron Beach, we preferred Isla Verde. This beach was more picturesque and what you’d imagine of a Caribbean destination. The sand directly in front of the hotel was immaculate, powder-soft, and free of trash and sea debris. As we walked further down the surf, it was apparent which parts of the beach did not receive as much attention. Spending time in the water at Isla Verde beach was a dream. No rocks or sticks beneath my feet and the water was calm, clear and beautiful. I never felt as if the ocean was trying to pull me out or knock me down. When we return to Puerto Rico with our kids, this is our beach of choice. An advantage of renting the car vs. taking an Uber to the Marriott was the ability to grab a change of clothing and head to the restrooms. We changed for dinner and drove over to Condado to the other Marriott resort for the evening. Again we parked in the indoor parking garage, and roamed around the beautiful hotel, visiting the restaurants and looking at menus. We ate off-site at a lovely restaurant Yerba Buena with live music and Cuban and Puerto Rican Cusine. My husband finally got the monfongo he’d been after the whole trip. Our last few hours in Puerto Rico was spent having fun on the slot machines and salsa dancing the hotel lounge. It was the perfect end to the perfect three day trip to Puerto Rico. The only thing that could have make it better is if he had more time. Get your parking card validated at the casino before leaving for free parking. Note; we did not know that the validation is only good for 30 minutes and stopped for one last salsa dance in the lobby before heading to the car. When we tried to exit our validation had expired, and Hubby had to go back into the casino to have it redone. So wait until you are ready to leave to validate. San Juan Marriott Resort & Stellaris Casino offers day passes. If you are in San Juan for the day, a cruise ship destination, a long layover, or waiting all day for a flight to leave like we were, and want to spend the day at a resort consider the day pass. The pass costs $60 per person and $30 per child for the day. It is not advertised on the website. The passes can be purchased at the front desk of the hotel upon arrival. If you need more information, call the hotel directly or email the concierge. We didn’t eat cheaply during our time in San Juan because it was our anniversary and we made it a point to treat ourselves as much as possible. With little opportunity to eat at fancy restaurants without the kids eating alone was nice but this isn’t our usual way of eating while traveling. We enjoyed cooking our own foods, which is also safe for me. And the younger boys are very picky eaters—pizza, french fries, and fruits if we are lucky. Awesome Gluten-free desert at Mesa Verde! Coconut Custard. Yum. If you are interested in trying more traditional Puerto Rican dishes, there are many restaurants at every price point to choose from, or you can try some at home. Will we return to Puerto Rico? Absolutely. We are already planning a return trip for this coming spring with the kids. We will do many different things with the boys in tow. There is so much more of the island to see! We can see ourselves spending a longer period of time in Puerto Rico soaking up the beautiful Carribean sunshine and basking in the culture. The closest airport to San Juan is San Juan Luis Munoz Airport (SJU). It is located Carolinas and only a short taxi ride (15-20 minutes no traffic) to Old San Juan. Although we live in the Adirondacks, the cheapest flight we found for this last minute getaway was out of McArthur Airport in Islip, NY. The airport is on Long Island and a very long six-hour drive from our home. However, using Skyscanner, we found round-trip last minute seats on Frontier airlines at $137 per person. It was worth the drive. When possible check all airports within a day's drive of your home, sometimes traveling is worth the savings. We use google flights and Skyscanner to find the best deals. Note: Sometimes packages through bookings or other travel sites work out better, so always remember to cross-check. This is an awesome post… and happy anniversary 🙂 I hope to get here someday soon! Thanks so much, I am glad you enjoyed it! This was my first post to our new travel website, and I hope to provide some fun pictures, inspiration, and helpful information. If there is anything you’d like to know about the trip or information you would’ve liked to have seen in the article, please feel free to let me know! I am looking to improve all the time. 🙂 Thanks so much for stopping by. This was great timing. We are planning a trip there and your tips and suggestions help me to add a few more activities. I am so glad! Hopefully, you will find our other posts about things to see in Old San Juan, and great places to eat helpful. Keep me posted after your trip, I’d love to see how you liked your visit to the island! We didn’t get to San Juan when we visited Puerto Rico. Next time hopefully. Oh no! Next time, make your way there. If you like old cities, I’d highly recommended Old San Juan. I fell in love with the place. I love this! I especially love all the tips and pro tips. Not mainly bloggers share those but they can be a lifesaver! Thank you, Becky! I know those “tips” that other bloggers share were always lifesavers for me, and what I appreciate the most when I read. I hope to continue to offer useful information to traveling families. What beautiful historic buildings. Sounds like a fabulous anniversary! I really have a thing for old cultural towns. Old San Juan was lovely. We visited San Juan last year and fell in love, as well. It’s a beautiful old city that’s full of life. One of the best things we did there was take a food tour–it was awesome!